Before we get into our tips, we’d like to point out an exciting new tool now on our website, the Tie & Cufflink Coordinator. Our Merchandising team has worked hard to provide five different ties and five cufflink options to match with each and every seasonal French cuff dress shirt. Simply click on the seasonal dress shirt of your choice, then click on the Tie & Cufflink Coordinator link like the one pictured above, and we’ll show you twenty-five different ways to accessorize that shirt! It’s an invaluable resource for novice and expert matchers alike, and we highly recommend you check it out. Now, back to our tips. 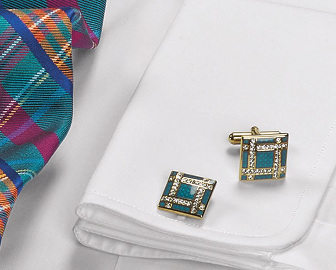 We recommend choosing cufflinks that complement the color of your shirt. For a more in-depth discussion of complementary colors, view our blog, “3 Essential Matching Rules.” Similarly, analogous colors – such as yellow and orange, blue and purple, or green and blue, may also be paired together. If you’re wearing a patterned shirt, you may also choose cufflinks which match one of the colors in that shirt. Perhaps you’re wearing a simple blue or white dress shirt. In that case, coordinate the cufflinks to your tie. In actuality, you may use this as an alternate pairing strategy for any color shirt and tie combination. Just follow the same guidelines as for patterns: small pattern plus big pattern, in cufflink terms, means bold cufflinks plus subtle tie, or vice versa. Try matching your cufflinks to one color in your tie as a highlight. Now that we have the basic rules laid out, let us try these strategies. This pairing works because blue tones work with both gold and silver. Indeed, gold, as a shade of yellow, is complementary to this purplish blue shade and this effect is pleasing to the eye. 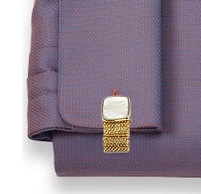 The cufflink’s gold tone is further enhanced by its echo in the shirt’s subtle infusion of orange color. The mother of pearl accent provides a focal point and as an accessory makes the look dressier. As we mentioned, blue goes with silver as well as gold. It also goes with its darker cousin navy, which can be a more formal color. Some believe shades of the same base color should not be paired together, but we feel that in this case it is not a problem. In general, the two shades must be different enough from one another so as not to possibly be confused; for example, navy and royal blue is a fine combination. The square design of the cufflink and the smaller area of bright color makes it a more subtle piece than the previous one. Next, we will bring ties into the mix. 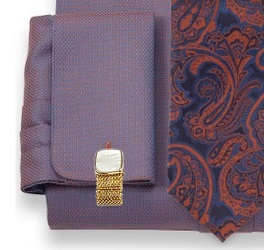 Since blue and orange are complementary colors, and orange and yellow are analogous colors, this dress shirt, tie, and cufflink combination is particularly effective. 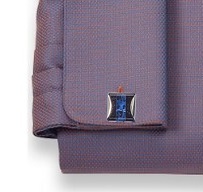 The tie features darker blue tones and a subdued rust orange against a dark navy background, so it is not in competition with the bold cufflink in this combination. 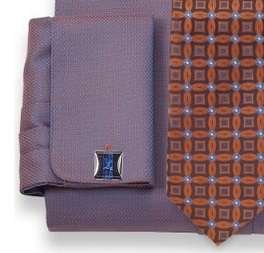 This particular tie pattern features a larger area of orange and correspondingly smaller patterns in royal blue and navy. As such, the cufflink complements rather than competes with the tie. The navy pieces of gemstone in the cufflink are complemented by the brown patterning sections in the tie, and royal blue matches back in both the tie and cufflinks. Neither the tie nor the cufflink is exceptionally daring in this combination, but they do find harmony of tone together. We know this isn’t all that easy. You may still feel a little lost. Thankfully, our buyers have already solved the issue for you! Our Cufflink buyer works closely with our Dress Shirt buyer through each step of manufacture. As a result, every French cuff dress shirt in the Paul Fredrick collection has a cufflink specifically chosen to match it. Simply click on the Matching Items link to view and add these perfectly paired accessories to your shopping bag. You are sure to find a combination you love among our looks, and if you’re feeling adventurous, try your own hand at it. Good luck! I am a bit color blind and I have a pair of venetian glass cufflinks in a teal (they look light blue to me) and I am always wanting to wear them with a tie that has another shade of blue (no teal). Does this work? Does teal complement other blues or clash? Thanks! Hi Stu! Other shades of blue can complement teal, but it’s difficult to say for certain without seeing the exact shade. Why don’t you contact us at custserv@paulfredrick.com, and a representative can assist you in making that match!